An online master's child development degree gives you the knowledge, skills, and confidence necessary to play an integral role in organizations committed to meeting children's needs from infancy through adolescence. Making a meaningful difference in young people's lives requires understanding their mental, social, and educational progress in order to help them grow into healthy, productive adults. Pursuing studies in child development enables you to recognize best practices in social services and education to assess effective programming. This degree affords limitless career options, including becoming a special education teacher, a profession the Bureau of Labor Statistics projects will grow 8% by 2026. Your master's degree in child development online coursework allows you to thoroughly examine child development theory, scientific literature, and relevant research. For example, your classes will explore topics like child and adolescent psychology and lifespan development. You should also expect to engage in research design and analysis. This advanced degree demands a firm grasp of subject matter through discussions, projects, and exams. Many programs also offer opportunities to choose a specialization within the degree. Some options for concentrations include family studies, teaching, or a focus on infancy. This enables you to customize your degree to match your academic and career interests. Degree requirements depend on individual programs. Moreover, course format can be either fully online or a blend of online and on-campus instruction. Carefully review each available program to determine which best suits your interests and scheduling needs. University of Minnesota Twin Cities ranks #1 on The 5 Best Online Master's in Child Development Programs! The University of Minnesota, Twin Cities is a public research university located in Minneapolis and St. Paul. UMN offers a wide selection of fully online programs, including 17 bachelor's degrees, 11 master's degrees, 13 doctorate degrees, and a plethora of undergraduate and graduate certificates. The school offers a master of arts in applied child and adolescent development for professionals interested in working with children. Students can choose from three different specialized tracks: infant and childhood early development, child life, and individualized studies. The infant and childhood early development track includes coursework in intervention in early childhood, early childhood assessment, and infant observation. The child life track requires courses in child life theory, therapeutic play for child life practice, and a 600 hour clinical internship. Upon completion of this track, students are eligible for the child life professional certification examination and the Association of Child Life Professionals eligibility assessment. The individualized study track is an interdisciplinary specialization that allows students to advance their studies in areas such as law, social work, nonprofit management, education, or nursing. To be admitted, applicants should hold a bachelor's degree and a 3.0 GPA or higher at their previous institution. Students pursuing the master's degree in child development online must complete 32 credit hours of coursework. Distance learners can finish the program in one to two years. Southern New Hampshire University ranks among The 5 Best Online Master's in Child Development Programs! Located between Manchester and Hooksett, Southern New Hampshire University is a private university that offers 308 online undergraduate, graduate, and certificate programs. Online courses are delivered through an asynchronous learning platform that allows students to attend lecture and complete assignments at their own pace, as long as they meet pertinent deadlines. Among their diverse selection of online programs, the school offers a master's degree in psychology with a specialization in child and adolescent development psychology. SNHU's online master's in child development can be completed in as little as 15 months. Core courses cover topics such as cognitive processes, theories of personality, developmental psychology, and intervention strategies. This curriculum trains students in methods of assessment, intervention, and prevention of psychological issues in children and adolescents. However, this program does not prepare students for state licensure. Applicants seeking admission should hold a bachelor's in psychology or a related discipline. Potential students must have completed coursework in introductory psychology, social science statistics, and research methods. If applicants have never taken classes in these subjects, they may be required to complete relevant courses upon admission to the program. No standardized testing is necessary. University of La Verne ranks among The 5 Best Online Master's in Child Development Programs! The University of La Verne is a private university located slightly east of Los Angeles. The school provides several fully online degree programs, including six bachelor's degrees and three master's degrees. La Verne's master of science in child development touts small class sizes and prepares students to teach at the community college level. Courses include studies in attachment, teaching adults, and cognition and brain development. The University of La Verne's online master's in child development requires 33 credit hours of coursework and can be completed two years. Asynchronous classes allow students to study on their own schedule. All online graduate students at La Verne have five years to complete the program. Core courses in this online master's degree cover topics such as educational psychology, research methods, and human development. Potential students must hold a bachelor's degree from a regionally accredited institution. Applicants should hold a 2.7 GPA or higher with a 3.0 GPA in the last 60 credit hours of coursework. Interested students may submit a statement of purpose explaining professional goals and any work experience related to children. Only California residents are eligible for La Verne's online programs. The University of La Verne is regionally accredited by the WASC Western Association of Schools and Colleges. University of South Florida ranks among The 5 Best Online Master's in Child Development Programs! Located in Tampa, the University of South Florida is a public research university that offers a lengthy list of fully online degrees as well as hybrid programs and online courses. The fully online master of science in child and adolescent behavioral health prepares students for a career working with agencies and schools to help children and adolescents struggling with behavioral health challenges. The curriculum offers four different concentrations: developmental disabilities, leadership in child and adolescent behavioral health, research and evaluation, and youth and behavioral health. USF's online master's degree in child development requires 39 credits of coursework. Students must pass a comprehensive exam and either write a thesis or conduct an applied project. The thesis track is designed for students who are considering conducting research or pursuing further study. The applied track is geared toward students who are not interested in working in a research-based setting. This track incorporates field experience components. Courses include cultural competence in children's mental health, child and adolescent behavioral health policy, and research methods in community health. The University of South Florida is regionally accredited by the Southern Association of Colleges and Schools Commission on Colleges (SACS). 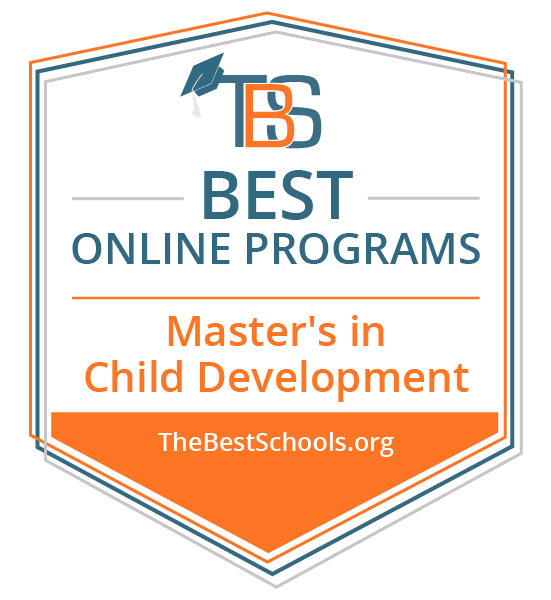 Missouri State University ranks among The 5 Best Online Master's in Child Development Programs! Located in Springfield, Missouri State University is the second largest university in the state by enrollment. The school provides a wide variety of fully online degree programs, including 10 bachelor's degrees, 14 master's degrees, 2 doctorate degrees, and several undergraduate and graduate certificate programs. Their online master's degree in early childhood and family development is designed for students who want to work in institutions of higher education, government agencies, nonprofit organizations, or private businesses to help children and families struggling with developmental and behavioral issues. MSU's online master's degree in child development requires 32 credit hours. The degree can typically be completed in two years over the course of four semesters. Required courses cover topics such as prevention of childhood abuse and neglect, educational research methods, and family advocacy. MSU also offers an accelerated program where undergraduate students majoring in child and family development, education, or psychology may begin graduate coursework during their junior and senior years. To be admitted into the program, applicants should have a minimum of a 3.0 GPA in the last 60 credit hours of undergraduate coursework. Applicants that do not meet the minimum GPA requirement must take the GRE. Students with prior graduate coursework may transfer up to nine credits with the approval of an advisor. Missouri State University receives regional accreditation from the Higher Learning Commission (HLC). A master's degree in child development online is the ideal credential if you wish to enter a profession such as a child development specialist, afterschool program director, or childcare center manager. These careers require an ability to communicate effectively with a range of ages and demand a strong commitment to ethical practices. Preschool and Childcare Center Director: This professional develops programming for children, manages staff, and maintains all budgetary aspects of facility operations. In addition, the director works closely with parents to update them on their child's progress. A master's in child development can better ensure your business management skills in a director position. Special Education Teacher: These teachers support the development of young people with emotional, learning, and physical impairments by tailoring instruction to meet their academic needs. They ensure students develop literacy and communication skills, assessing and working with those who have mild disabilities or a more serious condition. Some states require additional teaching certification. Social Worker: A social worker identifies community needs and assesses intervention options by reviewing clients' concerns. These clients can include families and children that face challenges like illness, homelessness, and abuse. This expert connects people to resources that can help them improve their circumstances. A master's degree in child development permits you to strengthen your case management and clinical assessment skills.